This is the introduction to a series on changes in the daily weather and extreme weather. The series discusses how much we know about whether and to what extent the climate system experiences changes in the variability of the weather. Variability here denotes the the changes of the shape of probability distribution around the mean. The most basic variable to denote variability would be the variance, but many other measures could be used. Studying weather variability adds more dimensions to our apprehension of climate change and also complexities. This series is mainly aimed at other scientists, but I hope it will be clear enough for everyone interested. If not, just complain and I will try to explain it better. At least if that is possible, we do not have much solid results on changes in the weather variability yet. The quantification of weather variability requires the specification of the length of periods and the size of regions considered (extent, the scope or domain of the data). Different from studying averages is that the consideration of variability adds the dimension of the spatial and temporal averaging scale (grain, the minimum spatial resolution of the data); thus variability requires the definition of an upper and lower scale. This is important in climate and weather as specific climatic mechanisms may influence variability at certain scale ranges. For instance, observations suggest that near-surface temperature variability is decreasing in the range between 1 year and decades, while its variability in the range of days to months is likely increasing. Similar to extremes, which can be studied on a range from moderate (soft) extremes to extreme (hard) extremes, variability can be analysed by measures which range from describing the bulk of the probability distribution to ones that focus more on the tails. Considering the complete probability distribution adds another dimension to anthropogenic climate change. Such a soft measure of variability could be the variance, or the interquartile range. A harder measure of variability could be the kurtosis (4th moment) or the distance between the first and the 99th percentile. A hard variability measure would be the difference between the maximum and minimum 10-year return periods. Another complexity to the problem is added by the data: climate models and observations typically have very different averaging scales. Thus any comparisons require upscaling (averaging) or downscaling, which in turn needs a thorough understanding of variability at all involved scales. A final complexity is added by the need to distinguish between the variability of the weather and the variability added due to measurement and modelling uncertainties, sampling and errors. This can even affect trend estimates of the observed weather variability because improvements in climate observations have likely caused apparent, but non-climatic, reductions in the weather variability. As a consequence, data homogenization is central in the analysis of observed changes in weather variability. In this series, I will first discuss the relationship between changes in extremes and changes in the mean and in the variability; see figure below. 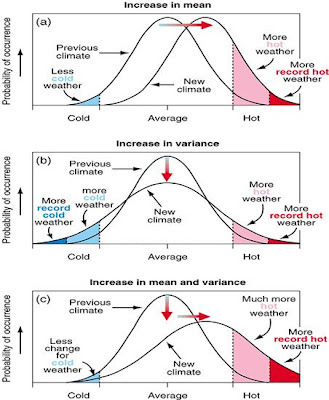 Especially changes in extreme extremes are connected to changes in the variability; this can be shown using extreme value theory and is reflected in the literature on climatic changes in extremes. Figure is taken from Real Climate, which took it from IPCC (2001). The next two posts will be on changes in variability from modelling studies and observations. These posts will present many results, which are, or seem to be, conflicting. One reason for this is probably the strong dependence on methodological choices given the complexities mentioned above. There does seem to be a pattern emerging: the temperature variability on inter-annual time scales is decreasing, while it is increasing on intra-seasonal time scales (important for for example heat waves). The variability of precipitation seems to increase: The increasing trends in median precipitation amounts are weaker than the trends in severe precipitation. An important reason for conflicting findings is likely the quality of the observations, this will also be the topic of a post. Inhomogeneities caused by changes in climate monitoring practices are already important for studying changes in the mean. Our basic understanding of the changes in observational methods and first empirical studies indicate that taking inhomogeneities into account is likely even more essential for studying changes in the variability. Empirical evidence comes from the results of new statistical homogenization methods for daily data and from parallel measurements with historical and modern measurement set-ups. Long time series are needed in order to distinguish natural (multi-decadal) changes in variability from long-term changes and large international datasets are needed to corroborate the results of regional studies and to put them into a larger perspective. Such efforts have, however, to bear in mind that up to now continental and global collections are not homogenized because of the immense – usually unappreciated - labour required. Currently, only smaller homogenized daily temperature datasets are available. There will also be a post on the research needed to understand changes in weather variability better. I see three main topics for future research on weather variability. The quality of the observations. The suitability of climate models. The analyses of changes in weather variability. The introduction to this series on weather variability. Argues that the more extreme the extremes are, the more important changes in variability is relative to the mean. On model results on changes in variability and the validation of the model results. A post on the beautiful paper by Reinhard Böhm on the variability of monthly data from the Greater Alpine Region. First part of a series aiming to entice more statisticians to work on homogenization of climate data. A discussion on homogenisation at a Side Meeting at EMS2012. Great. This is a very interstig and complex topic and I'll be waiting your posts on the subject. I've been interested in how climate change affects variability (if it even does) and as a non-expert it's very hard to understand the state of the literature when finding several papers with conflicting results. Nice to hear there is some interest. The more scientific posts are read a lot less. Yes, I would second Daneel's comment. I look forward to the rest of this series. But I do have one question. When you say the "variability of precipitation seems to increase" are you referring to observations? And if so, is this the same as saying there are more extreme precipitation events than there used to be? Rachel, yes, I think I had observations in mind. It would also be valid for climate models. It is probably the mainstream opinion that precipitation variability is increasing. The "seems" comes from me, I am not that sure yet, because I am not sure whether the quality of the data is sufficient to detect such changes. Variability is not the same as extremes, but they are closely related. Extremes can change because the mean changes or because the variability around the mean is changing. That is the topic of the second post.